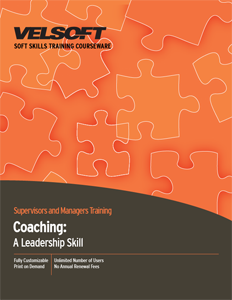 Coaching: A Leadership Skill Training Material is designed to train supervisors’ coaching skills and develop effective leaders in the workplace. Train your supervisors and managers how to properly define coaching and communication skills, develop critical coaching skills and learn the benefits and consequences of coaching and leadership. Seeing is Believing This sample manual to teach Coaching: A Leadership Skill is in MS Word format. Coach, Role Model, Counselor, Supporter, Guide...do these words ring a bell? Being a coach involves being a role model, sometimes a counselor or supporter, and always a guide. Coaching is based on a partnership that involves giving both support and challenging opportunities to employees. Knowing how and when to coach is an essential skill that can benefit both the participant and the organization. Some coaches and leaders are tyrants, with a “my way or the highway” attitude. This may work for some organizations or teams. Other leaders or coaches are firm but fair. They realize it is a give-and-take relationship with open communication. They are motivational and rally the team. This coach supports team ideas when needed and is firm on decisions and direction when the tough decisions need to be made. The late hockey coach Herb Brooks once said: "You're looking for players whose name on the front of the sweater is more important than the one on the back.” Train your managers and supervisors how to find the opinion leaders in the organization, which employees are on the fence, and those who fear change. Use your opinion leaders to recruit the fence sitters, and you take time as a coach to sit down with those who need change management support. and see what is stopping them from getting on board, find some common ground to show how working as a cohesive unit will benefit everyone! Train your supervisors how to motivate and develop their staff members into strong leaders. This will create a strong team bond, raise productivity, and create a more cohesive management team! Training Materials for Coaching and Leadership Skills is customizable to meet your training style. Add your own coaching philosophy for a personal touch if you like! This course will have you developing all-star leaders and coaches in the workplace in no time! Save more on Coaching: A Leadership Skill Training Material by taking advantage of Velsoft Training Bundles. Want to see all of the topics you will cover? Check out the Coaching: A Leadership Skill Course Outline.